Colin Salmon plays M’s aide and Deputy Chief of Staff Charles Robinson in Tomorrow Never Dies, The World Is Not Enough and Die Another Day, but it’s not until his third and last Bond film that he is dressed almost to a level of elegance equal to James Bond’s. That is not to say that he is dressed like Bond. 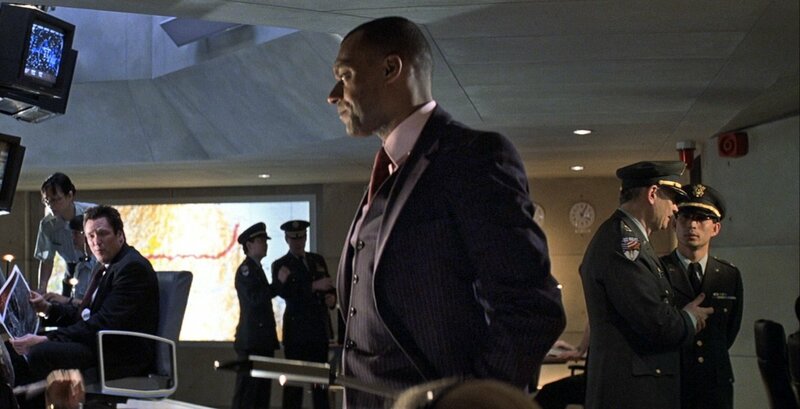 Robinson is dressed in Die Another Day in a much flashier manner in a navy three-piece suit with red chalk stripes. The suit is most likely from an English brand, judging both by the jacket’s cut and the presence of a ticket pocket. The button two suit jacket has padded shoulders with a slight pagoda effect that is emphasised by roped sleeve heads. The jacket has a clean chest and a gently suppressed waist. The pockets are straight with a ticket pocket. The waistcoat has five buttons down the front, and Robinson leaves the bottom button open. The waistcoat, however, is too long and reaches far below the waist. The length is a common problem with ready-to-wear waistcoats. Waistcoats are made too long to make up for people wearing their trousers too low, but waistcoats weren’t originally designed to be so long and thus are unable to fit the body well below the waist. The waistcoat’s buttons are also too far apart. Robinson’s suit trousers have a straight leg and probably a flat front. Apart from the waistcoat, the suit fits very well. The waistcoat gives this suit away as ready-to-wear. Robinson’s pink poplin shirt appears to be from Turnbull & Asser. The shape of the collar—mostly the inward curve of the outer edge—matches the shape of the Classic Turnbull & Asser collar and the double cuffs have the link holes very close to the fold, just as Turnbull & Asser makes theirs. The shirt also has a narrow front placket. The pink in the shirt pulls out the suit’s red stripes. The red tie also coordinates with the suit’s red stripes. The tie has horizontal ribs, which means the tie is woven with a 45-degree twill weave. Since good ties are cut on the bias (cut on a 45-degree angle to the cloth’s warp and weft threads), a 45-degree twill wale will either become horizontal or vertical. Robinson’s tie has a fine yellow windowpane pattern. The tie is tied in a windsor knot with a dimple. Robinson’s black shoes have too heavy a sole to be worn with this elegant suit, a problem that is hardly noticeable when the shoes only have a couple seconds on screen. Whilst Robinson isn’t perfectly dressed, he is one of the best-dressed men in Pierce Brosnan’s Bond films. I think the tie’s knot is too long and large for the collar. While it’s extremely difficult, if not impossible, to out-dress Brosnan-Bond in terms of elegance, Robinson looks every bit the gentleman in this suit, well done. Of course one of the first things that came to mind when viewing this post was that the color of the shirt almost looks… Salmon! Very smart indeed. I often wear a similar-looking (I hope) outfit, dark blue pinstripe suit with either a pink or white shirt and deep red tie. Nice to see him wearing a three-piece, too – they seem to have had a real resurgence in the last few years and I hope things stay that way. Brosnan, as usual, is simply overdressed. I don’t like his films very much so I am probably biased against him, but he typically looks more like a suave, sumptuously-dressed New York mafia boss than a hard-nosed spy. Connery got it right: simple, neat, no frills. Brosnan looks great, but not Bond-appropriate. Funny you should say that about Brosnan, since this outfit is his simplest outfit and, apart from the scarf, is very Connery-Bond-like. I guess it must be my bias showing through then! That and the scarf, which doesn’t strike me as very Connery-like. Colin Salmon does indeed look very good here. I really like the combination of pink with navy. When was the last time Bond wore a pink shirt? Connery in DAF? Did Roger Moore ever wear a pink shirt? I actually remember reading somewhere that Colin Salmon was in consideration for Bond himself at one time. He certainly could rock the three piece suit. Although he should really ditch the goofy soul patch he has now. Connery only wears pink casual shirts in Thunderball and You Only Live Twice. Lazenby, and only him, wears pink shirts with his cream suit and navy blazer. Hello Matt, I have a question for you. 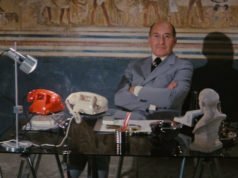 Do you keep a database file of Bond outfits, scene-by-scene, or do you rely on an encyclopedic memory to say whether the character has ever worn this or that? I have the basics in a database file, but most of what is in there and more is in my memory. I actually look to my blog usually to things I don’t remember. There’s far more detail here than in my database I created years ago. 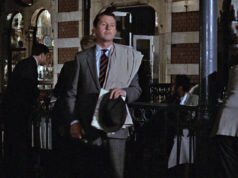 Roger wore what appeared to be a stripe shirt in a shade of dark pink with his “office briefing” flannel suit in “A View to a Kill”, albeit with white collar and cuff. Does that really count for sethblack’s query? He wore pink shirts in “The Persuaders” and “The Man Who Haunted Himself” and I have seen him wear a light pink shirt (again with white collar and cuff) paired with his trademark navy blazer for interviews etc. in the past. In a way its a pity he never wore a solid one in say light pink as Bond as it would suit his complexion however, perhaps the producers felt pink wasn’t somehow appropriate for Bond. I don’t really know. In earlier times, a red stripe on a bespoke suit was reserved for former officers of Guards formations, as a reference to the scarlet of their parade tunics. But, of course, as with regimental ties, that requirement has probably fallen by the wayside. Though Robinson may be ex-Guards and perfectly entitled to the stripe. In any case, a good suit, apart from the too-long waistcoat. The red tie/shirt combo is not for everyone but Robinson seems to pull it off, but it’s too much of a statement for a field operative like Bond. It makes sense considering his both his job supplying intelligence to M travelling around he world with her and his ability to defend her and HQ by force if necessary that Charles could be an ex-Guard. Not a huge fan of the red stripe, whatever its associations may be, but I do like the cut of the suit. The early 2000s were actually a good time for menswear from what I recall. The ’90s eccentricities had worn off and I suspect that, because suits were not quite in fashion as they once were*, they had stopped trying to mess with it so much and stay safer. Salmon’s suit does not date very much at all. For that matter, neither do Brosnan’s in this movie or TWINE. *The dot com boom and bust plus the rise of Casual Everydays were probably factors. 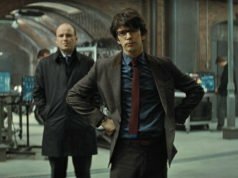 Comment:Colin Salmon is nice suited.